“Squeeze” your site visitors into subscribing with these great tips! A squeeze page is a landing page with one goal: to collect email addresses. In fact, all squeeze pages are landing pages, but not all landing pages are squeeze pages. Whereas a landing page encourages your site visitors to take a specific action, a squeeze page encourages your site visitors to take one action – to give you their email address. Creating a squeeze page for your website that shows your visitors that a special offer awaits them, but only with the release of their email address, is a great way to “squeeze” people into taking action and getting further involved with you. In fact, squeeze pages are a popular marketing technique used by some of the best industry professionals. Today we are going to look at how you can create a compelling squeeze page for your site visitors as well as some useful tools you can utilize to make sure your site visitors get the best (and least distracting) squeeze page possible. What Makes a Good Squeeze Page? Many elements go into making a squeeze page successful. Besides being simple, short, and to the point, creating an effective squeeze page takes a lot of careful thought. Take a look at and see what you should include in your website’s squeeze page if you hope to build a bigger email list. A lead magnet is something you give away to site visitors in return for their email address. Basically, it is the prize for subscribing to your email list. The key to a good lead magnet is to make the offer so enticing your site visitor will have no choice but to sign up. It should be ultra-specific to your niche, should aim for a very precise target audience, and should be something your readers would love to have right now. And remember, whatever you are offering should only be available via email. There is no sense offering up something your readers can easily gather from a competitor. 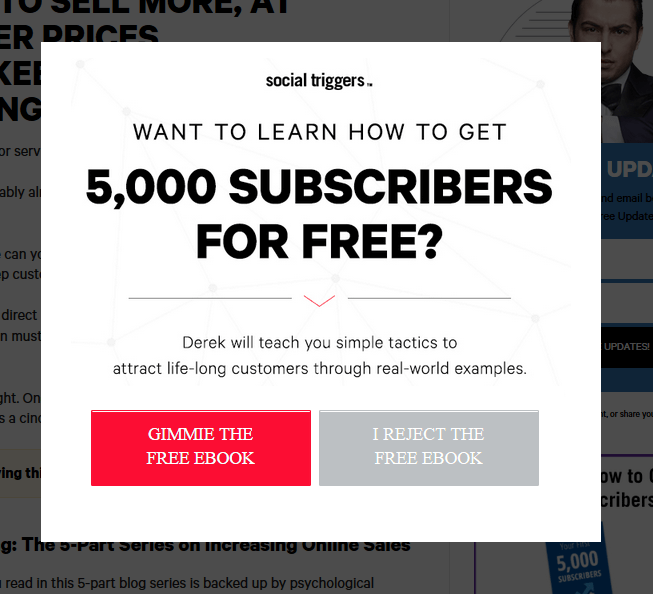 Notice Social Triggers’ use of a free eBook as a lead magnet. In the end, the point of a squeeze page is to gather email addresses from interested site visitors. There really is no other way of doing this effectively without a solid lead magnet. Though a seemingly simple concept, it is important to remember that squeeze pages are not tricks. It should be obvious to any site visitor viewing your squeeze page that you are looking to sign them up to your newsletter list. More so, your reader will instantly understand that in exchange for their email address they will receive something highly valuable. 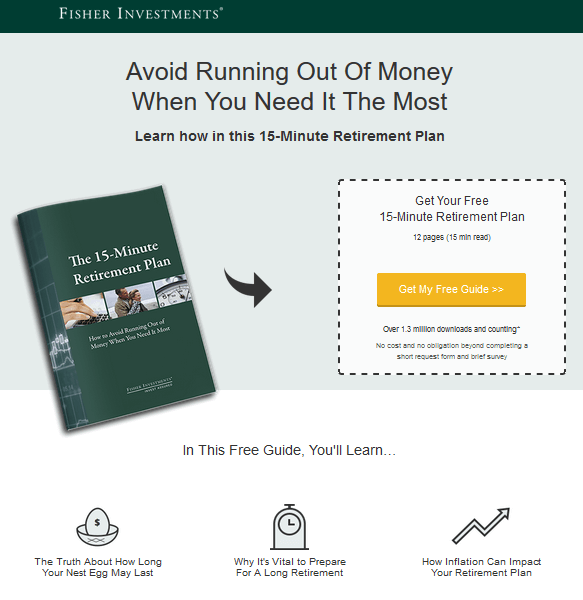 Fisher Investments makes it very clear what is being offered in exchange for an email address. 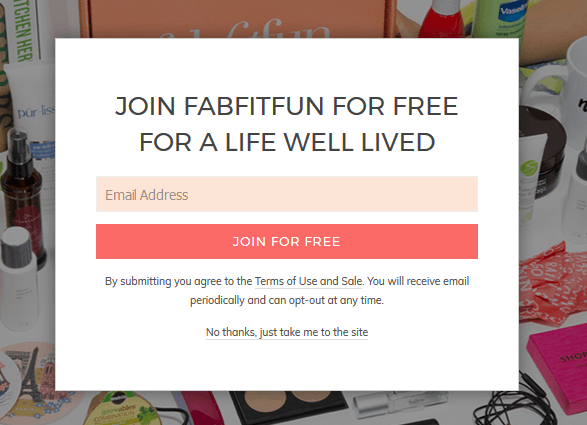 Minimal text, color, and distractions make FabFitFun’s squeeze page effective. Altogether, it is your job to plainly show your site visitors why signing up for your email list is a good idea – with the lead magnet – and nothing more. Let the rest of your website go into detail about your business, your values, and your products or services. The words and phrases you choose to use on your website’s squeeze page can make or break people’s desire to sign up. You aim is to convince readers to give up their email address, not bounce away and look for something else of more value. One of the best ways to do this is to use quality copy. Smart Insights offers compelling social proof in their squeeze page. For example, try adding statistic to reinforce the value of the offer and to speak to those who have benefited from this offer in the past. This may include things such as the number of comments, subscribers, or followers. Another option is to include a short video clip explaining why signing up is a good idea. Lastly, make sure to use unique copy in your submit button. Notice Kissmetrics’ solid headline, subheadline, and submit button copy. Okay, before you start debating me…this is not set in stone by any means. However, plenty of site visitors out there believe (despite its effectiveness) that traditional popups are just annoying. That said, in order to get around displaying an annoying popup on your squeeze page, but still get the same effect a popup would have (e.g. the collection of email addresses), you can try a splash page instead. Ben Settle uses an effective splash page that redirects visitors to the main site with one click. Much like a landing page, a splash page is a page that appears when a site visitor seeking out your website’s homepage clicks on your website in a search result or types in your site’s URL. Typically, this kind of squeeze page also includes a nice, “No thanks, take me to the main site,” message for those that are not interested in what you are offering. Now that you know what makes a good squeeze page, let’s look at some of the available tools for actually constructing a squeeze page. 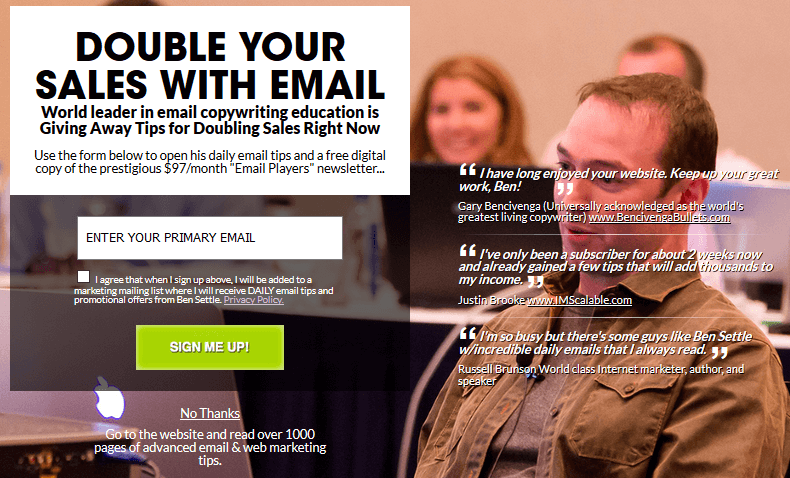 Best suited for creating landing (or squeeze) pages, this WordPress plugin has what you need to convince site visitors to sign up for your email list. For instance, add your company’s logo, customize background colors and images, add a custom headline and description, and even include social icons to encourage social sharing. WordPress Landing Pages provides you a simple way to add a squeeze page to your website using the Visual Editor. More so, track conversion rates and make improvements, run A/B tests, and choose from several landing page templates. Plus, add functionality using some of WordPress Landing Pages’ third-party add-ons. This squeeze page creator lets you create unlimited mobile-friendly and responsive squeeze or splash pages for your WordPress website. With plenty of templates to choose from, a convenient drag-and-drop builder, multimedia support, and built-in autoresponder services, this plugin has your squeeze page needs covered. 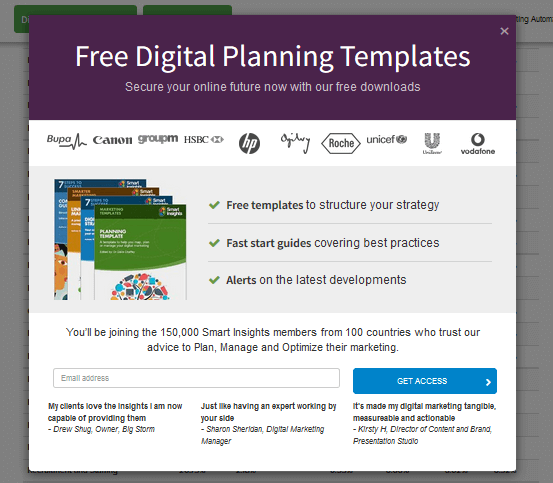 Use Thrive Landing Pages to create fully customizable squeeze pages for building a bigger and better targeted email list. Choose from 162 templates, utilize the drag-and-drop builder, add multiple content types (testimonials, tabs, countdown timers, content boxes, and more), and enjoy the Thrive Lightbox as an exclusive bonus to purchasing the Landing Pages plugin. In the end, make your website’s squeeze page truly unique using this powerful landing page creator. Attract more visitors, collect emails, measure growth, and make more money using this premium squeeze page plugin. With Optin Ninja, you can enable autoresponder emails, implement A/B testing, choose from 20+ page templates, and even add video to your squeeze page for the ultimate visual appeal. In the end, this opt-in plugin lets you create stunning squeeze pages that will encourage even the most skeptical of site visitors into signing up. In the end, squeeze pages are a wonderful addition to your overall marketing plan if you are looking to build your email list. In fact, connecting with new visitors and nurturing your loyal relationships via email is one of the best ways to share your valuable content and promote your products and services. However, you have to have the emails in order to capitalize on this remarkable strategy. 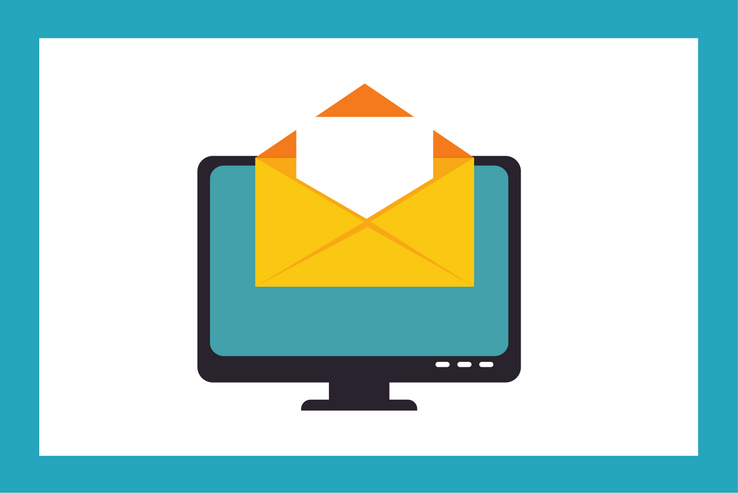 Convincing readers to give up their email address is a tricky task. People want to feel that getting more email in their inbox than they already do is worth their time. By starting a new relationship by offering something of high quality and value for free, in exchange for an email address, you will find many readers are more willing to make that exchange. With so many options available for creating squeeze pages on your website, why not try to add a squeeze page to your website today? With a few clicks here and there, you will see new relationships start to form right away and your success continue to climb. Have you ever used any of the above-mentioned tips or tools for creating a squeeze age for your website? I would love to hear all about it in the comments below!